I was told that they could not take my Audi TT in for repair because they had no more rental cars, until next week. Audi Service Advisors Randel Patteson said I was causing the engine malfunction buy starting the car and pushing down the gas paddle. Park Place Audi said they couldn't find a problem with the Audi TT! Park Place Audi told me to come in and take a driving test from their dealership. Somehow my driving is making the entire Audi TT systems malfunction. Right! November 23,2001 Denied repair of my Audi! 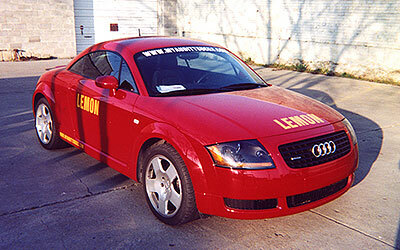 Took the Audi TT in for warranty repair service but I was denied that service. Audi's reason for service denial was my cars decoration in a manner they don't agree with. The Service advisor said, The Audi Store consulted with Audi America and they told them The Audi Store does not have to service my car under the warranty terms specified in my sale contract. would call the police to arrest me! 3: Pontiac Sunfire / 1 time. The Sunfire was so bad that I Trade it in for a Saturn. Seven times in different rental cars and no Audi's were provided!